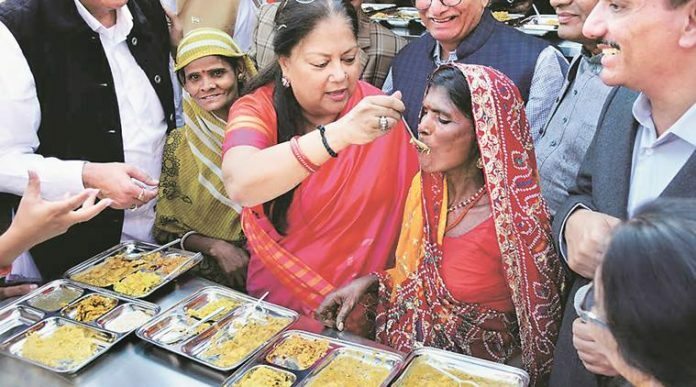 Inspired by Late Tamil Nadu Chief Minister Amma Jayalalithaa, Vasundhara Raje, Chief Minister of Rajasthan has inaugurated a new scheme ‘Annapurna Rasoi Yojana’ on December 16 to feed poor, Dalit and Gujjar women. The new scheme will provide food to poor people at affordable price. The new scheme offers breakfast for Rs 5 and lunch for just Rs 8 only. Rajasthan Government’s new scheme will offer the best food to the poor people at pay for rates. Launching the new scheme, Chief Minister Vasundhara Raje said, “The government is going to open more outlets across the state. Within two weeks, we can open more than 80 outlets in 12 districts of Rajasthan to help poor those who are starving for food. “The Annapurna Rasoi Yojana offers the best food with various dishes. I tried them just now, and it is very yummy. The Government is providing the food at affordable prices especially for those who work hard and poor people,” she added. She said Annapurna means ‘Bhandaar,’ so there should be no shortage for anybody. Along with Chief Minister Vasundhara Raje, Shreechand Kriplani, Autonomous Regime and City Development Minister, MLA Ashok Parnani and Mayor Ashok Lahoti have also participated in the launching event. Apart from these Rajasthan Power Minister, Suman Sharma, State Woman Commission President, Parliamentary Secretary Kailash Verma, MLAs Mohanlal Gupta and Surendra Parekh, CEO Hemant Gera were also graced the event. Raje also congratulated power department for fitting LED streetlights and supplying LED bulbs.